When it comes to navigating a crisis, communication is key. If people attend exercises that are so outlandish, it’s hard to take away anything useful. They might begin with a fire…and a tornado—no, now it’s a sharknado! Professional communicators from colleges across the state gathered at Illinois State University to exchange ideas and learn from Illinois State experts at a One-Day Crisis Communications Workshop in September. Participants from cities such as Freeport, Harrisburg, Quincy, and Elgin packed the University’s Emergency Operations Center (EOC) to take part in a tabletop exercise led by Illinois State’s Director of Emergency Management Eric Hodges. The communicators faced challenges that might come if a tornado caused damage at their colleges. “Who authorizes sending an alert? Who sends the alert and over what channels?” asked Hodges as workshop attendees threw out answers and ideas. A 20-year veteran of county and state emergency management, Hodges noted the key to the drill was not to have all the answers, but to understand the questions that will surface. “Throughout any disaster, communication is the cornerstone of situational awareness,” he said. Eric Jome (left) and Eric Hodges (right) address a crisis communications workshop. The workshop also featured a lunchtime talk-back with Illinois State Director of Media Relations Eric Jome. Building on the exercise’s scenario, Jome questioned participants on how they would set up a press conference in the wake of the tornado, and to anticipate questions and messages. Nate Carpenter talks social media at a workshop in the Emergency Operations Center. 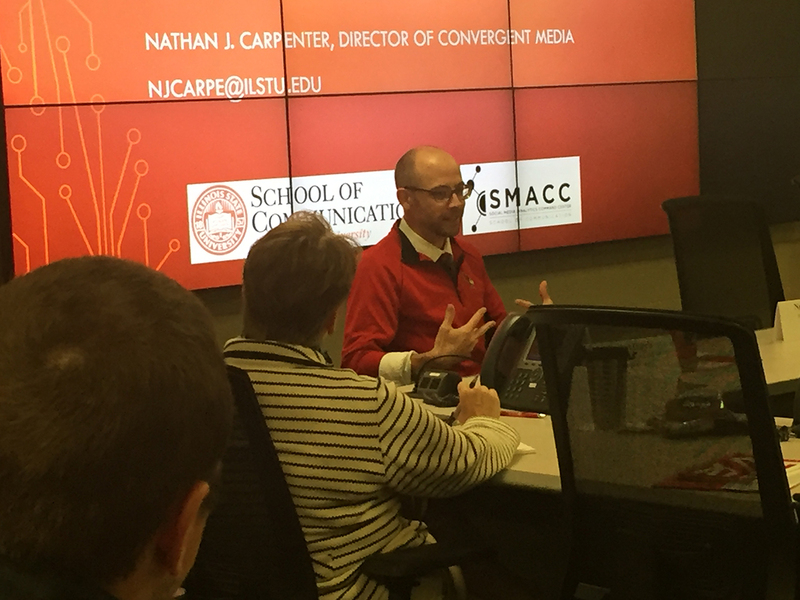 Illinois State’s Director of Convergent Media Nate Carpenter walked the group through social media monitoring during a crisis. Carpenter, who serves as the lead coordinator for the University’s Social Media Analytics Command Center, provided workable solutions to social media searches during a crisis, and ways participants could hone monitoring.